In order to best capitalize on the opportunity available when building a brand new property, Smartohms Limited, both client and installer, decided that the knowledge and experience available from SOLFEX together with industry leading Photovoltaic Panels, Solar Thermal Panels and Air Source Heat Pump would produce the best possible integration of a multitude of technologies. With aesthetics and panel performance being extremely important, Ten Kioto 225wp Mono PV Panels with black frames and black back sheets were selected which are complemented with two IFK 2.1 in roof solar thermal collectors coupled to a twin coil heat pump and solar thermal domestic hot water cylinder. The centrepiece of the heating system is the Samsung 9kW RC090MHXEA Air Source Heat Pump, which, coupled to a wood burning stove, via a buffer tank with integrated coil can provide all of the heating and hot water requirement for the property at even the coldest times of the year. 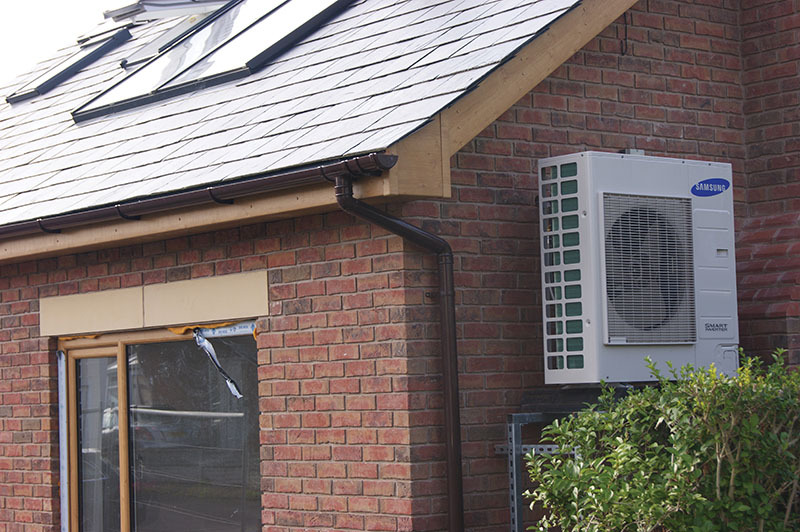 In order to ensure that the running costs are as low as possible, the heat pump has been integrated with underfloor heating upstairs and downstairs to create a very efficient heating system.